Warranty, 1 year parts & labor. If the cart needs servicing it is the customer’s responsibility to take it to 3 places for fair price quotes or to send it back to our plant for servicing. We reserve the right to choose which if any of the quotes we will accept. If the cart cannot be fixed locally it can be returned at the customer’s expense to our nearest repair facility. We will return it back to the customer at our expense. The following are not covered by warranty; freezing damage, umbrella wind damage and damage caused through neglect or improper maintenance. 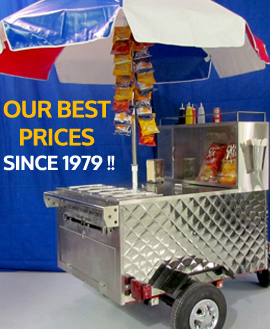 ALL AMERICAN HOT DOG CARTS hot dog carts are warranted for 1 year, parts + labor against flaws or defects. We want you to buy from us again so our service will continue long after you’ve paid. Getting into business for yourself takes courage, we realize that, and that’s why we do our very best to make it as easy for you as possible! If you find a better priced hot dog cart of equal quality within 7 days of receiving your order we will refund the difference. If your hot dog cart should fail due to workmanship or material defect we will repair or replace it at our cost. No Arguments. We reserve the right to decide whether cart will be repaired or replaced. We are so confident that you will love our products that we offer a full ten (10) day return policy if item is returned in new condition in original factory pallet. Shipping is non-refundable and buyer is responsible for return shipping cost. This does not apply to custom orders.